Based on my own calculations I’d say I had about a 70% success rate in meeting my goals, which isn’t bad. – Saved up enough money to go Indie again in 2011, yeah! This is as a result of careful budgeting, getting a $500 discount on my rent, and Helen (my wife) getting a job later in the year. – Co-created the Vancouver Indie Meetup group and made a ton of amazing friends. – Learnt a ton about Facebook game instrumentation and metrics. Also learned some interesting new ways of thinking about business. – Competed in several game jams to make mini-games. – Gained over 30% net profit in my first 6 months trading on the Stock Market. – Hosted a week-long Aikido seminar in Vancouver. – Did the Grouse Grind in under an hour. – Drove the family to Osoyoos (the only Desert in Canada) for a vacation. – Had a weekend honeymoon sans children on Bowen Island. – Improved my acoustic guitar playing a lot and learned the basics of slide guitar. – Cobbled together the money to pay an unexpected $16,000 tax bill! – Finished my orthodontic treatment! My braces are off but I have to wear a retainer for a while. 1) Have great fun making Indie games for the entire year. 3) Make at least $100K (I’ll aim relatively low for my first year back in the driving seat). 4) Build up the Vancouver Indie Meetup into something even more awesome. 5) Finish my Toastmasters CC manual (4 speeches to go) – I took a break when things got crazy earlier in the year. 6) Keep fit and beat my Grouse Grind time of 56 mins. 8 ) Have an awesome Spring/Summer with my family in Vancouver and go on some roadtrips. 9) Move back to the UK and have some money in the bank when I arrive. – My dad was very ill over Christmas 2009 (he had been in ill health for years). Luckily he recovered and I thought about flying back to the UK to see him to spend some quality time with him in case he got very ill again and didn’t make it. But I didn’t go because we were crunching at Big Fish on a Facebook game and I didn’t have any spare money for flights. In late March he suddenly became seriously ill again and I flew over to see him and managed to speak to him for a minute or so before he passed away on March 27th. Apart from the whole experience being extremely traumatic, I deeply regret not following my instincts and going over to spend time with him earlier in the year. Jobs come and go, and you can pay back credit cards, but you can’t bring back a loved one for one last conversation. That’s the lesson I learned, real hard. Don’t make the same mistake that I did or you’ll regret it forever. – On a similar note I realised after my dad passed away that I should be spending more time with my boys and guiding them along as they were having troubles with various things. I tried to negotiate working part time at Big Fish during the summer, but they wouldn’t allow it, so in the end I took two weeks of unpaid vacation (the max allowed by my contract) in a single block at the end of the summer. Perhaps I should have fought harder, or even just quit, but it would have really screwed up our finances that had just taken a beating from a massive unexpected tax bill. I just really needed the time off to spend with my family and to process my emotions. As a result I’ve mostly locked my thoughts and emotions in (not healthy) so I can deal with them in January when I’m not at work all day. There may have been a better way I could have dealt with all this, although at least I did lots of acoustic guitar playing which has helped. Also I believe I can spend even more time with my boys being a good influence and teaching them stuff, so I’ll need to really get on the case with that in 2011. Well, there you go, two very personal mistakes that stand out the most to me. There have been tons of others too I’m sure, but I prefer to focus on all the stuff I did achieve in 2010, especially with my father passing away early on, as that rather “knocked me for six”. So what about your goals for 2011, and your successes and mistakes in 2010? Please let me know! Last weekend I took part in Ludum Dare 19 which is a 48 hour game jam. However, I started pretty late and only had 7 hours to make a game! The theme of the competition was “discovery” and my wife and I came up with an idea of having a person clearing away their mental fog by seeking out cups of coffee, and avoiding spikes. I used my BlitzMax minigame framework to make the game, and also I made all the content (crappy art and basic sound effects) in 7 hours flat (including a brief lunch break). Then after I submitted it to the competition page (please vote for it! ), I spent a further 3 hours plugging in a title page made by Matthew Laurenson and tarted up the graphics and added some more sounds/polish. I’m pretty pleased with the final result considering it was a 10 hour game. Of course there’s more I could have done with it given more time, such as made the character get the jitters if you drink the coffee too quickly, but the nature of game jams is that you have to severely limit scope in order to finish. Those of you who’ve done a game jam before will know what I mean 🙂 If you haven’t done one, I really recommend it. 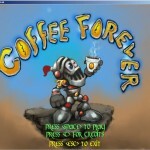 There’s a Global Gam Jam coming up in Jan 2011, check it out. Anyway, give it a go and let me know what you think! Thanks.